When thinking brings pleasure. When thinking brings pleasure? : Who will train our “artificial puppies”? But more importantly – who will train the trainers? Two questions which will haunt AI developers very soon. Who will train our “artificial puppies”? But more importantly – who will train the trainers? Two questions which will haunt AI developers very soon. So far my "interventions" into the field of AI development have been sporadic, and the full picture comes with the reading of all major pieces on the matter: e.g. Relax! The real AI is Not Coming Any Soon! This is the second piece on AI training. What will happen to a puppy when it grows up? The answer to this question depends on how the puppy will be raised. Its physical health depends on the food and exercises his owner will be providing on the everyday basis. But it's skills, what it will be able to do, what commands will it understand and execute and how good it will be on doing that, depends solely on how good will be the job the trainer will be doing when the puppy will be growing up. The best trainers can make animals do amazing things. Dogs can sniff out drugs, find people covered by a snow avalanche, recognize a gun and bite the hand which holds it. 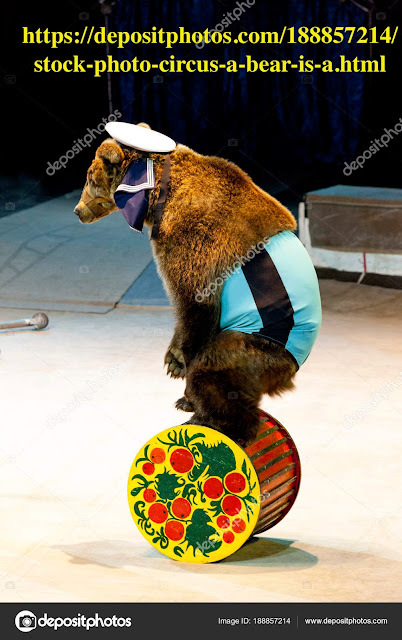 Everyone who was in a circus knows that animals can do things which even some people cannot do, for example ride a barrel. But what will happen to a puppy if it will not be trained? It will simply remain being a puppy, but in an adult body. Physically – an adult; but mentally – still a puppy. Exactly like humans who do not get a good training, a.k.a. education, or an AI system - due to the same reason. So, instead of talking about animals we could talk about people. For example, if baby Einstein would be left in jungles with monkeys, he would become a monkey – a very smart one, but still a monkey. Or if a baby Einstein remained living with people, but would not get ANY education, he would still be very smart, but he would not be able to create his relativity theory. In fact, he would never write a single paper. To do that he would have to invent – completely on his own – the alphabet, the grammar, arithmetic and algebra, trigonometry and calculus, and also rediscover all physics laws. And even if he would be capable of doing all that, he would simply have not enough time. But for the purpose of this paper we do not need to talk about people. Animals will do. Because currently there is no single AI system which would be smarter than an animal (and such a system is not going to be developed any soon, don't trust the hype - it is just a hype ). What AI can do today does not exceed what a trained dog can do, i.e. recognize certain objects (including faces), recognize certain voice, and voice commands, and execute those commands. Lots of effort has been focused on developing algorithms which would allow AI to make less mistakes when recognizing certain audio and visual (or other) patterns. To achieve the highest possible rate of successful pattern recognition an AI algorithm should be able to correct its own mistakes (via “deep” and other types of learning AI specialists had borrowed from educational psychology) and that – according to AI enthusiast – makes it intelligent. Like a toddler who learns do not touch a hot plate, or like a puppy which learns do not bite a bee - intelligent action of deep learning. Using our analogy between a puppy and AI, we say that the most of the effort in AI-development field has been channeled into creating “artificial puppies”, or AP (in a general sense - an AI system does not have to look like a puppy). People who were creating those AP, also were their trainers. Of course, they needed to know that the AP they made was trainable, or they would have to develop a different algorithm. However, recently the situation in AI field has been rapidly changing. The biggest players in the field of AI (Google, Microsoft, and many others) know now very well how to create an “Artificial Puppy” (of several kinds), and can even mass produce those AI systems. Large companies like Google, or Microsoft rent out their AI to startups and companies exploring AI opportunities. Using our analogy, we say that nowadays anyone can “buy” an “Artificial Puppy”. Getting “a puppy” is not a problem anymore. The problem is how to train it properly and effectively so the “puppy” would be doing for the owner all the “tricks” the owner wants it to do. 1. You need to hire for your puppy a good trainer. 2. You have to become a good trainer yourself. Which actually is just one option: you need to find a good trainer, and then either have him/her to train your puppy, or have him/her to train you how to train your puppy. And that is the problem AI professionals ignore or try to avoid to discuss (who would want to kill the hype?). There are no many good professionals in the field of training AI systems. The existing good AI trainers are those people who have been involved in the process of the development of the existing AI systems. Everyone else is like a veterinarian trying to convince us that he/she can perform a heart surgery on people (or even a “village”/medieval doctor selling potions for every know illness). Every day (well, maybe every other day) there is another publication predicting that soon AI will do something very amazing (including killing all humans). And those publications are not wrong. They just greatly exaggerate the timing. Nothing significant will happen any soon. But eventually AI will be able to do everything what a biological intelligence spices can do (for starters, reading Isaac Asimov would help to get prepared). Everyone who considers using AI for his/her company should know about “porridge from an axe” effect, described in “The Dawn of The New AI Era” (a 6-minute read); and “On a Definition of AI” (an 8-minute read) is helpful to gain a better understanding the essence of AI (and on the essence of thinking in general). Just keep in mind that the simplest model of any currently available AI systems is “an artificial puppy”. If you want to have it, figure out first what do you want from it when it "grows up" (i.e. trained and functions). Any AI system is – yes – a system. Like a car, or a heating system in a house. There are people who design and develop it, people who install and maintain it, people who write the manual, and people who use it, a.k.a. users or customers. If you are a user of AI you should know what you want to use it for, and learn how to use it. If you want to use a car you do not need to know anything about internal combustion, or a torque and gear rotation. You need to learn how to operate it and keep it in a working condition. For that you have a driving school, or a friend, or a parent (or, if you believe in your good luck, you can try the oldest scientific method – trial and error), and a manual. But there is a difference between using a car and AI. You do not have to train a car how to drive, it has been built that way. To use AI you have to train it to work the way you need it. You need to know WHAT do you need from your AI, what does your AI need to do for you. And you have to teach your AI to do it properly. And you need to know what does "properly" mean for you. your AI will be useless for you. The fact that in order to be useful AI must be properly trained is hidden between the lines in publications saying, paraphrasing, that “it is not just about the amount of data, it is about how the data are structured”. And who will be structuring your data for you? AI professionals are not experts in your field, they are experts in developing pattern recognition systems, but that’s that. And even if AI will recognize some patterns in your data, how would you know that those patterns are at the core of your company’s functioning? For example, for a long time based on the visible patterns people thought that the Earth was flat and the Sun was moving about it. Those are just a few of the important questions to everyone who is considering to use AI for their business. AI developers will NOT be able to answer those questions. Professionals in knowledge production, science development, and experts in human intelligence WILL. 5. train the customer in using a specific AI system. Such professionals do not need to be proficient in coding, or in AI development in general. The core abilities of such a professional are an ability to analyze, and an ability to teach (those abilities are necessary, but not sufficient). The difference between a good “AI training representative” and a bad one is very similar to the difference between a good teacher and a bad one. When in action ("in a class in front of students") they look very similar, but the results are very different. 2. begin designing the new profession. The sooner the new profession will become a professional field, the sooner and broader will AI be adopted in all areas of economy. Top AI developers/promoters reported to the Congress that AHLI will not be achieved at least for 20 more years. Despite the fact that the need for professional AI trainers will grow much faster than advances in the development of human level AI, professionals in AI field do not pay as much attention to AI training as to, say, ethics. For everyone who is struggling to figure out what AI could do for his/her business, I can help with this simple approach. Imagine you can hire as many interns as you want. They don't know much, but you can train them to do some simple but tedious job. Imagine how would you train those interns to do that job. Here it is - this job can be done by AI trained as an intern. You're welcome! And finally, a word to investors. AI investors need to be careful when considering handing their money to a new startup which has "AI" in its title. Recently "blockchain" has become a buzzword. A company can change its name by including "blockchain" in it, and investors are ready to put in it their money even if the actual business run by the company has nothing to do with using a blockchain technology (but may "explore an opportunity to use it", like "Long Island Iced Tea"). A similar phenomenon seems happening with "AI". The best way to make a decision about an investment would be to hire an expert in AI who can audit the startup and clearly state: is AI indeed at the core of the company's business, how much of the company's workflow is relied on the use of AI technologies, could AI be replaced with a more traditional technical solution? 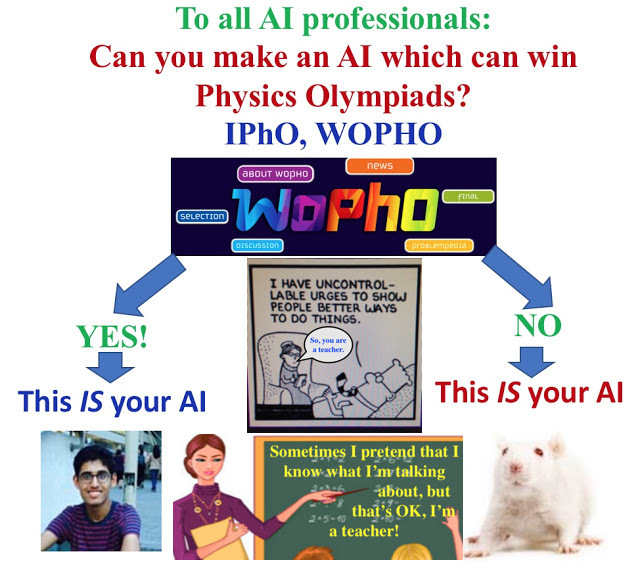 BTW: to my best knowledge, so far, no large company or a small startup takes on the challenge of developing AI which would be able to win a Physics Olympiad (theoretical part). This just demonstrates how far AI yet from actual intelligence (although, such AI can be developed).